A space armada slowly takes shape a hundred million kilometers above the elliptical plane of a star; the target planet does not have the military to stop the massive BattleMech invasion that is about to be unleashed on their world. Instead, a handful of men slowly maneuver in disguised, pressurized, polymer bags towards their targets. After attaching to the ships, they cut a hole in the bulkhead and sneak towards the fragile Kearny-Fuchida core that makes hyper-spatial travel possible. Knowing death is the only outcome, they disable the fleet, aborting the invasion before it has begun and changing the course of history. They have no name, no history, no life beyond their service to the state. They are covert operatives. 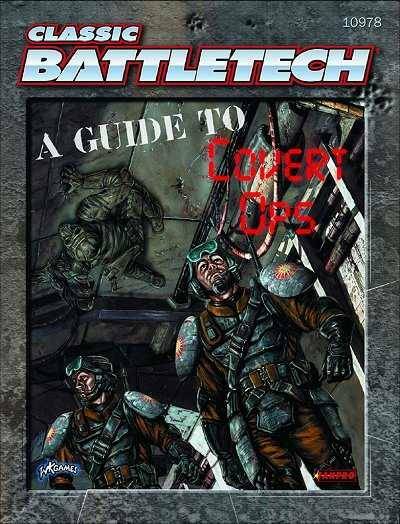 A Guide to Covert Ops provides detailed information on every intelligence agency in the BattleTech universe. Additionally, extensive Life Paths covering everything from DEST to Lohengrin and Valkyrie to SWAT are included. Finally, new specialized espionage gear, campaigning rules and a complete adventure provide all the information and tools players and gamemasters alike will need to enter the covert world of special ops.